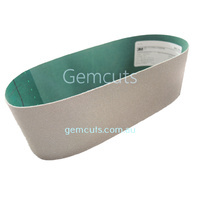 Diamond Plated and Resin Bonded Diamond Belts for Lapidary or Glass Work. Diamond belts come in two types: Diamond Plated or Resin Bonded. 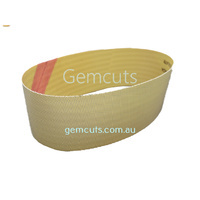 Diamond Plated Belts are generally used for grinding and shaping and work very well on stone and glass. 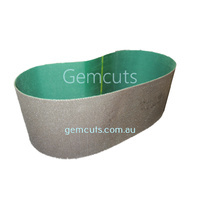 They are long lasting and provide an alternative to diamond plated or sintered diamond wheels. Because they are commonly used on rubber expandable drums they have some flexibility to conform to the contours of object being shaped. 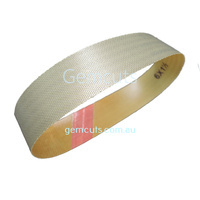 Resin Bonded Diamond Belts are also used on rubber expandable drums. 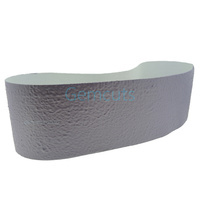 They are not designed for sanding gemstones and glass and should not be used for coarse grinding or shaping. 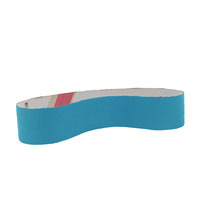 Resin Bonded belts are much less aggressive than diamond plated belts. This is because only some of the diamond is initially exposed as it is buried within the resin coating. As the resin coating wears down more of the diamond particles become exposed. 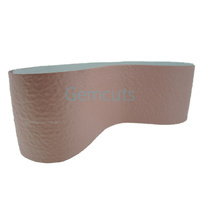 Our Resin Bonded Diamond Belts are available in a wide range of grits from coarse sanding right through to a high polish.